Last year, we had reported that online insurance market in India will swell to Rs 20,000 crore by end of 2020. Researched by Google India and Boston Consultancy Group (BCG), the report said that right now, the digital insurance market in India is valued at Rs 700 crore, out of which life insurance related products account for Rs 300 crore while non-life insurance related products consume the remaining space. Within non-life insurance, Motor Insurance market online is Rs 250 crore and Health & Travel related market is Rs 150 crore. In the coming 6 years, it is expected that online transactions in both of these segments will increase by 20 times. However, if we examine the usage pattern of non-life insurance market in India, then we may encounter several questions, such as whether non-metro users buy such insurance policies online? Is it a niche phenomenon? Are tablets and large screen mobiles more successful in getting an online customer? 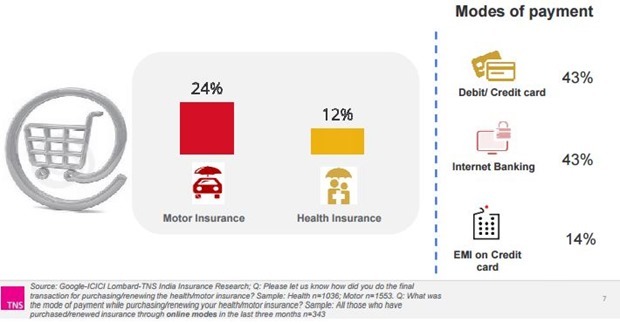 ICICI Lombard and Google India tried to decipher some of these questions related with online insurance market in India, and some interesting results came out from this research. People are, infact, buying non-life insurance online, and the trend is fast catching up. One of out of four respondents has bought motor insurance online; and 12% have bought health insurance online. When it comes to mode of payment, then Debit or Credit card accounted for 43% share, while Internet Banking also had 43% share. Interestingly, EMI on Credit Card accounted for 14% share. This would come as a surprise for several veteran insurance agents: Online buyers are more matured and responsible when it comes to paying the premium. As per the research, those who bought online health insurance showcased 35% higher probability of paying their policy in 2nd year. Infact, online customers 25% more inclined towards purchase of family floater plans, compared with offline customers! When it comes to age, then everyone between 25 to 45 years are buying such non-life insurance online, and thus, age is no more a factor. 25% of the respondents who admitted buying any non-life insurance are aged between 25 to 35 years, 20% of them are between 36 to 45 years and 26% are between 46 to 55 years of age. Hence, the more the age, more is the probability of buying non-life insurance online! And the trend is actually catching them young. 15% of all online customers between the age 25 and 35 are first time buyers, compared to 8% between 46 and 55 years of age. This is so untrue as per the research! 59% of all respondents between the age 46 to 55 will migrate from offline to online mode of insurance payments (renewals, premiums), when it comes to health insurance, and 39% when it comes to motor insurance. For the bracket between 36 to 45 years, 43% of the respondents will migrate to online mode of payments and renewals for health insurance and 41% when it comes to motor insurance. Hence, the future is certainly positive for the insurance market in India, as not only existing, but non-existing Internet users will also become part of this market in the coming years. As per the research, and data extracted from the ecommerce companies, non-metros are leading the trend of online purchases. And insurance market is no less different. 82% of the respondents from non-metro area admitted purchasing either health or motor insurance. Infact, compared to metro, non-metro users will be more inclined towards online renewal of policies. Compared to 8% in Metro, 15% from non-metro has purchased a health insurance online! Right from ecommerce to baby care, travel and insurance, non-metro Internet users are way ahead of metro Internet user. One of the reasons can be lack of such facilities and infrastructure in non-metro regions, compared to metro area. The research also indicated some buying trends of online insurance; for example screen size doesn’t matter now as both mobile centric users and PC/Laptop users showcased similar trend while making purchases of insurance policies online. Infact, mobile users are more inclined to make the purchase right there, compared to non-mobile users. Maybe this impulsive buying behavior is prompting India’s biggest ecommerce player, Flipkart, to go app only shopping mode? Branding is another factor which is very crucial when it comes to online purchase of non-life insurance, especially heath insurance. Ability of settle payments accounted for only 65% share, compared to 88% devoted to branding. If we talk about obstacles to online purchase, then the most difficult thing is to get queries resolved online, and the ability to select the best policy, based on the requirements and budget. Lack of any personal contact in the whole process also seemed a major obstacle. Overall, the scenario and market potential of online non-life insurance market looks promising, and bright. The market is well into it’s way to swell 20 times it’s current size within the next 5 years. "5 Myths Busted About Indian Online Insurance Market: ICICI Lombard-Google Research", 5 out of 5 based on 1 ratings.